With my “Fake-dar” alarm ringing loudly in my head, I decided to pursue this “unbelievable” ad, just to see how I could mess with the seller. As might have been expected, by late afternoon of the first posting day on Craigslist, the Mercedes listing had been “Flagged for Removal”, and in fact had disappeared from the website. 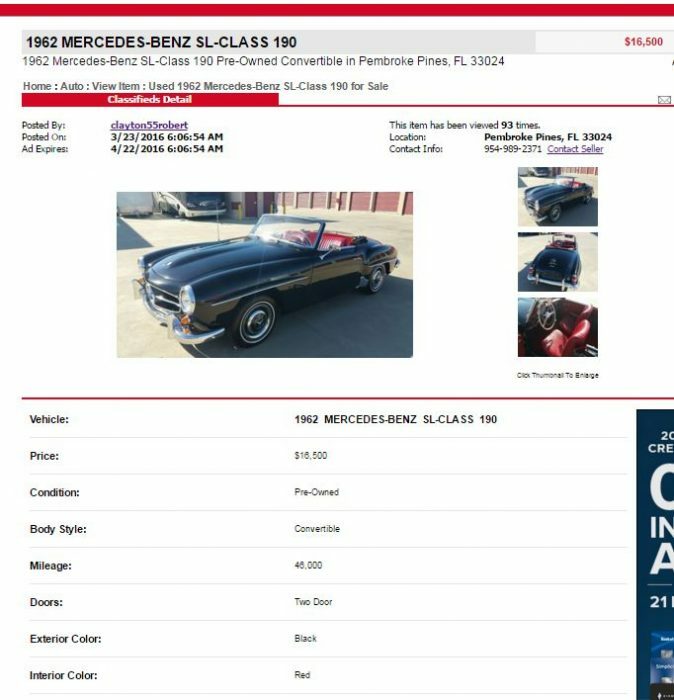 Not to worry, though, as a quick search turned up the exact same listing (same price, pictures, and cryptic description) on 4 or 5 other online cars-for-sale websites, all citing the identical email contact info. To confirm my assumption that this was a bogus ad, I spent a good hour on Google, convinced that the pictures and description for this ad had been “lifted” from a legitimate ad somewhere on the web. My diligence paid off, as I finally located the “real” listing, on eBay, indicating that the car had recently sold for the sum of $72,000 (the listing including several less-than-flattering images of the car which were “tastefully” omitted from the scammer’s listing). I decided to portray myself as an eager buyer, using a fictional email address. I am very interested in the car. Where can I see it? 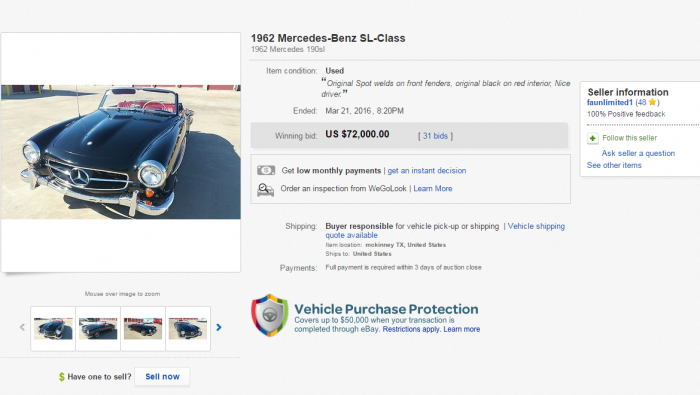 I wanted to let you know that the 1962 Mercedes 190 SL is still available. I recently divorced and moved to Canada and the car is here, too. Sorry for the confusion with the location, I advertised my vehicle nation-wide because it is still titled in the United States so there will be no import taxes or additional fees to pay. I own it free and clear. It is in great condition, no dents or scratches. It wasn’t involved in any accident and it is a non-smoker. The asking price is $16,500. I had a buyer offering $17,500 and I’ve lost about 10 days waiting for him to pay just to find out in the end that his loan wasn’t approved. I don’t want to offend you, but the car is priced for a cash deal so please if you intend to apply for a loan or financing this will not work. Because of the amount involved and the distance, I want to use a dealership for closing this deal. If you are not aware of how they work you should know that they will allow you to test drive and inspect the car before I get the money. You will have 3 to 5 days allowed for inspection, to decide whether you want to keep it or not before they release the funds to me.I look forward hearing from you. Yes, consider it sold! I have cash. Can you send me a Bill of Sale? Where do I send the funds? Would a bank transfer be appropriate? Will you coordinate shipping of the car back to Texas? Let me know what I should do next to complete this transaction. I’m going to explain how the process usually works . 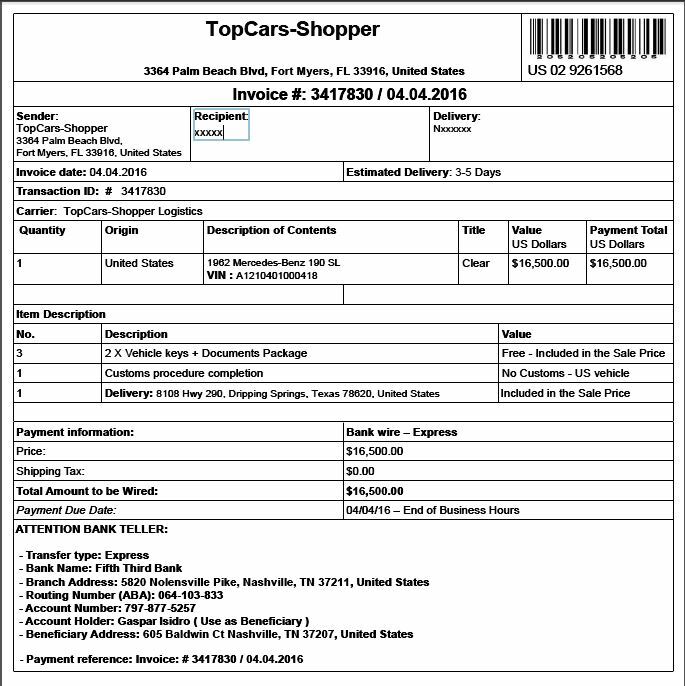 Using a dealership TopCars-Shopper as mediator you will have to secure the funds in a verified non interest escrow bank account, managed by them, until the inspection period ends. After I have the confirmation of funds secured from you and the dealer, the vehicle will be shipped to you. It will come with all the docs, including the title, service book, purchase invoice, keys, etc. The inspection period will start on the arrival date, you will have 5 days to take the vehicle to a garage, test drive it, check out the papers. You will get with it an used vehicle affidavit, a paper you will need to fill in with your decision when the inspection period ends and fax it over to the mediator. Based on the affidavit they will pay me, or refund you. 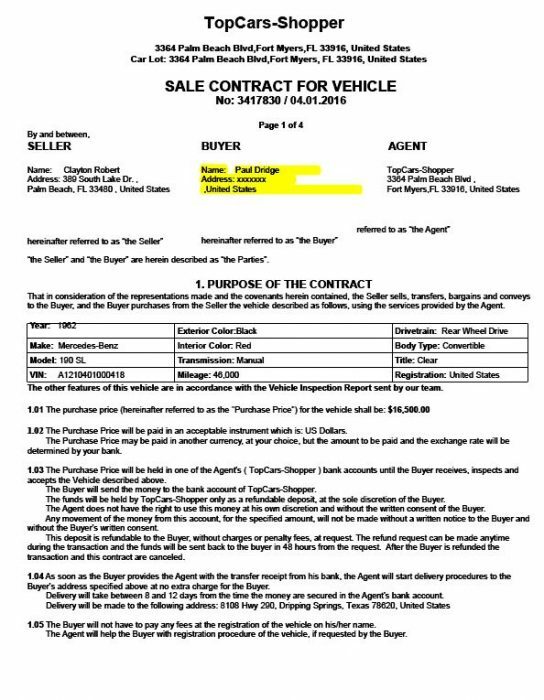 If you find hidden defects, a salvage title, etc, anything else different from what I described you just need to fill in the affidavit and fax it over to the dealership. If you reject the vehicle, they will fully refund you.Provide me with your zip code and complete shipping address and I will register you as my buyer. My name is Clayton Robert . The fastest way to communicate for the moment is via email because as i told you i am out of country in Canada and I don’t have roaming activated on my mobile. Anyway this is my number 682-710-2207 You can give me a message and I will reply back . A message is cheaper than a phone call in these conditions. Wouldn’t you know it… the street image actually showed the dealer’s sign, with a phone number prominently displayed. Naturally, I called the number to inquire about shipment of “my” Mercedes 190SL, and, not surprisingly, the company knew nothing about such a transaction, and assured me they don’t perform those types of services! We are waiting for payment confirmation in order to start the shipping process. Always remember to complete your transactions with TopCars-Shopper Company – it’s the safer way to trade. I trust this information is helpful and wish you all the best for your future trading with TopCars-Shopper Company. Please don’t hesitate to contact us if you have further queries or require assistance. 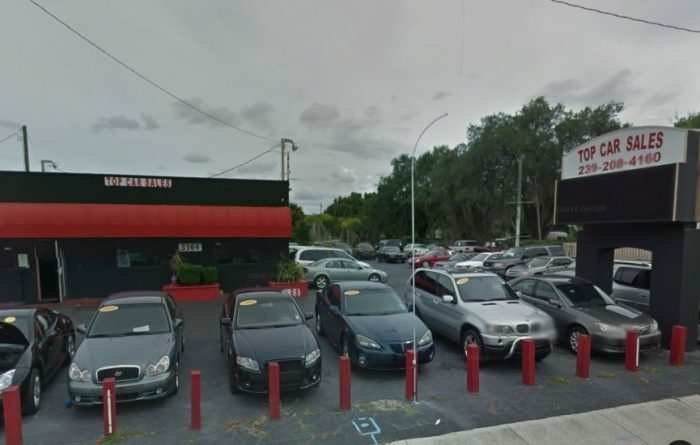 We value your business and thank you for using TopCars-Shopper Company. At this point, I decided to see just how long I could stall this scammer with excuses, to give me time to contact the bank in Nashville, as well as the FBI Internet Fraud department. Good day, and thanks for your followup. My wife and I are very excited about getting this car. We have been dreaming of owning a Mercedes 190SL for quite a long time, and this one is beautiful. Your invoice came sooner than I expected. 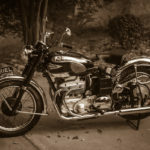 I have actually sold one of my vintage motorcycles, and am waiting to receive the check, which was sent on Friday from California. Once I receive it, I will immediately deposit in my bank, and then there will be a 2-3 day hold until the check clears. At that time, I will be able to complete our deal and initiate the bank transfer. Sorry for the delay, but we are very serious buyers, and will complete the transaction very soon. Hello Paul , I guess i should keep the car for you in this case.Please let me know when you’ll be able to complete this transaction. Good news! The check finally arrived today. Unfortunately I was away from the house, so too late to deposit today. I’ll go to the bank tomorrow, then find out how long they will hold the check until releasing for wire transfer. Should be just a couple of days. I should be able to make the transfer on Monday. I guess I will need another invoice, since the other expired. Thank you for the information , I will inform the dealership to send your new invoice on Monday morning . Thank you very much you really are a serious buyer. Sorry, I was at work all day, didn’t get the invoice until I got home and the banks are closed. Why not send one more invoice and make the due date TWO days from the day you send it, so that I can have reasonable time to receive it and then get to the bank the next morning? I am definitely anxious to complete this transaction and get the car on its way to me! Oh,i’m sorry to hear that but I think there must be a way to resolve this.Please let me know . Just to let you know I completed the wire transfer this afternoon. My bank is a small local one, and they have to go through a larger subsidiary for wire transfers, so it may be a day or so before you see the money. You have been a patient and honest seller, and it has been a pleasure dealing with you. Please let me know when the car will be shipped. Thank you Paul. 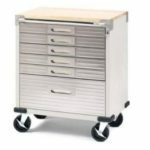 All you have to do is to confirm the payment to the dealership and for this you must send them the bank receipt in order for them to start the shipping process.After that they will let you know when the shipping will start . Thank you for all keep in touch !! 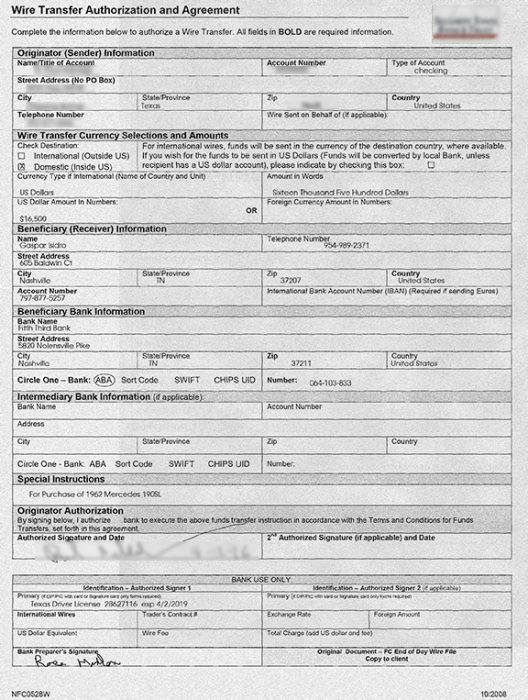 I have attached a downloadable copy of my bank’s actual wire transfer receipt, showing the path to your bank. Thank you again for a very pleasant transaction. We can’t wait for the Mercedes to arrive. Of course, I never received another response from the seller. 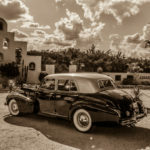 But, just for good measure, while the above communication was in process, I had created yet another anonymous email address and had inquired to the seller about the car, under that address, just a day or so after advising him the wire transfer had been sent. Naturally, the seller advised me that the car was still available for sale. The email below was my final parting shot to this scammer. 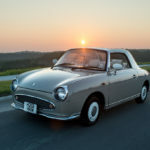 And, sure enough, within 24 hours, I was unable to find any further on line listing regarding this car or this seller. Mission accomplished! You are such an amateur you didn’t even have the intelligence to write your own description, choosing to just copy it from the legitimate auction. Be advised that I have tracked your email IP address to your personal computer, and have identified your scamming bank account with Fifth Third Bank. I have already advised your bank to place a hold on your account pending further investigation. I have digital copies of the numerous fake ads you have placed on various online websites. Unless, within 24 hours from this notice, you REMOVE ALL of the fake ads you have placed, I am turning all of my information over to the FBI internet fraud department. If you know what’s good for you, you will remove these ads, and CEASE from any further attempts at ripping off honest citizens. Rest assured, I am now tracking your computer’s IP address, and I WILL find your next fraud attempt, regardless of what fake name you use, or what bogus vehicle you come up with. STOP NOW, or I WILL FIND YOU AND BRING YOU TO JUSTICE.